Dr. Michael Horton is a scholar, pastor, professor of systematic theology and apologetics, and president of White Horse Media where he co-hosts the weekly radio program. He is also the author of many books including For Calvinism. Know what you believe and why you believe it. Faithfully submit yourself to your shepherds. Find supplemental Christian education where you can. Be ready to have an answer for everyone who asks you for the hope that you have, and be able to articulate that winsomely, gently, and with clarity. We’re living in a time when the average non-Christian has such a corrupt view of Christians and Christianity because of so many of the visible representations of Christianity that non-Christians see. They need to come in contact with the real thing. They won’t know what a counterfeit is like until they actually come into contact with the real thing. This desire to see Christians knowing what they believe, why they believe it, and being prepared to have an answer, will be evident in Dr. Horton’s message at our 2012 National Conference. Here’s a preview of what to expect from Dr. Horton in Orlando this March. In the centuries following the Enlightenment, the flood of challenges to Christianity has been ongoing, and in the last century they have increased at a rapid rate. Scientific advances have become challenges. As the world has grown smaller, encounters with other religions have also raised challenges. In this message, Michael Horton looks at the way many Christians have responded in fear rather than taking up the challenge and offering a reasoned defense of the faith. 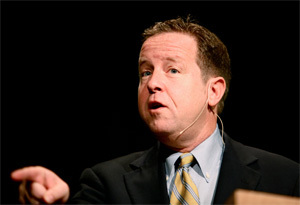 On March 15-17, 2012, we invite you to come and hear Michael Horton and the White Horse Inn at our 2012 National Conference, “The Christian Mind.” It will be an edifying time of fellowship and teaching together, helping prepare you to think like a Christian in an anti-Christian culture.